Erik Satie (1866-1925) and his music influenced the music of many of the great composers living in France during the late 19th to early 20th century: Debussy, Ravel, and Stravinsky among them, as well as the group known as Les Six. His music, much of it written for solo piano, went contrary to that of the large-scale romantic composers of the late 1800’s, and he was regarded as a rebel by his followers, breaking the bounds of convention. His is music of ethereal, wistful, graceful melodies but at other times is full of humor, liveliness and satire. Satie’s music tends to be sparse or transparent in texture, the pieces short, often featuring a rhythmic ostinato throughout. He employed old modes and unusual scales, unconventional harmonies and harmonic direction, and root chords and planing, all of which can be heard in the music of Debussy. Humorous or odd phrases sometimes appear above the music throughout Satie’s pieces. Phrases such as “Give it a good look” or “Pass the word” seem placed to puzzle and amuse, rather than to clarify the composer’s intent. The Aubade is the second piece in a set entitled Avant-dernières pensées (Penultimate Thoughts), written in 1915. 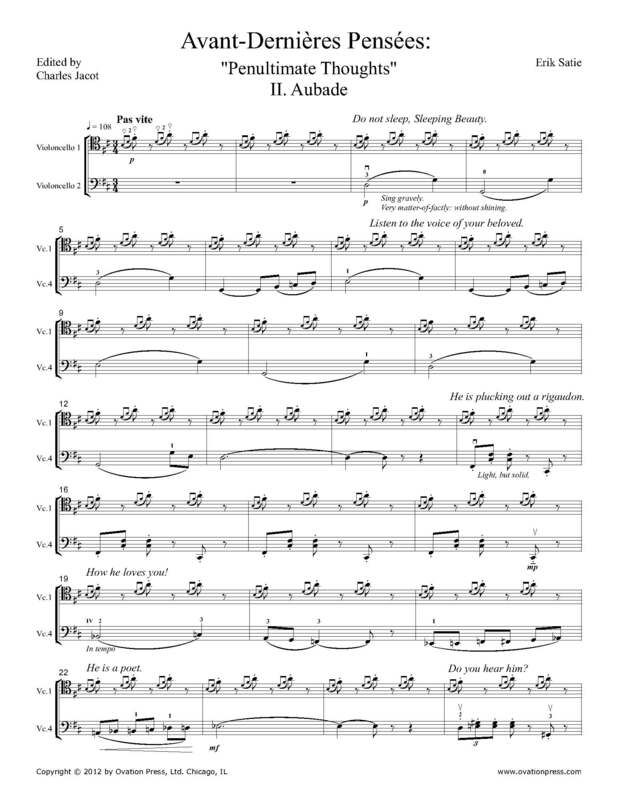 Ovation Press also offers Satie's Aubade from Avant-dernières pensées for Cello Quartet Arranged by Charles Jacot.